It was a great day for away sides in the ISPS Handa Premiership this afternoon with four sets of visitors picking up three points on the road and defending champions Team Wellington the only team to buck the trend with a home victory. The other notable feature of an action-packed afternoon was the amount of net-bulging that went on with 24 goals flying in across the five games. Leading the way in that regard were title-chasing Eastern Suburbs, who hit five strikes past cellar-dwellers Hamilton Wanderers in a hugely entertaining encounter at Porritt Stadium. All Whites midfielder Moses Dyer found the net twice while Andre de Jong notched his eighth goal of the season as Derek Tieku and Matthew Palmer also struck. Suburbs had put themselves in pole position with a 2-0 lead at half-time but Wanderers made a game of it with an Armin Pasagic penalty and threatened to pull-off a remarkable comeback as further goals from Liam Hayes and Tommy Semmy put them in touch at 3-4 down. But Dyer made sure of Suburbs’ win with his second and the Aucklanders now share the ISPS Handa Premiership lead with Team Wellington. 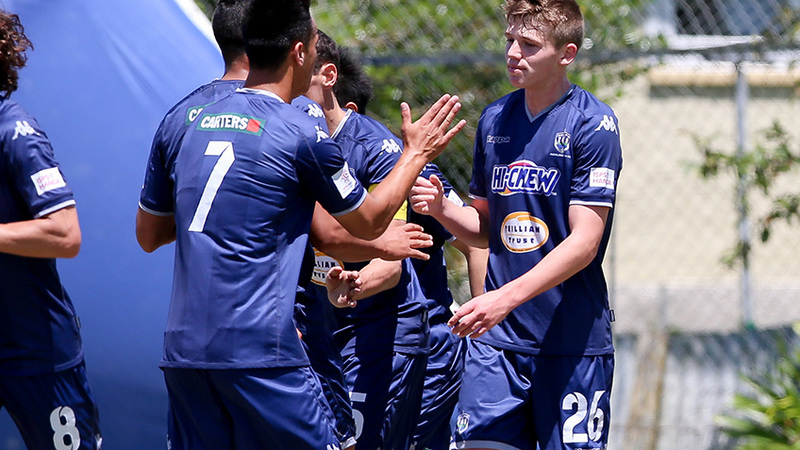 Auckland City FC are just two points behind the leading pair after an important win in Christchurch over fourth-placed Canterbury United, thanks largely to the clinical finishing of Emiliano Tade. The Golden Boot favourite now has 13 strikes to his name after giving the Navy Blues a 2-0 lead at the break, the second goal of his double coming from a superb free kick. The Dragons put in an improved showing in the second spell but couldn’t please the bumper crowd at English Park with the goals to take anything from the game. Canterbury counterpart Willy Gerdsen had few qualms about the result. Staying in the South Island, Southern United were on track for a good result when defender Stephen Last headed home a corner mid-way through the first half of their derby against Tasman United. But Daniel Allan did likewise for Tasman to equalise shortly before the interval and there was time for the visitors to go in front before the teams headed to the sheds, former Wellington Phoenix star Paul Ifill slotting home from the penalty spot. A brace from Maksym Kowal gave Tasman a three-goal cushion in the second half and Southern did manage to hit back – new signing Alex Ridsdale scoring against his previous club on debut – but could not prevent a 4-2 loss at Sunnyvale Park. “It was extremely disappointing because we totally dominated for 35 minutes and then totally switched off and lost the run of the game unfortunately,” Southern coach Paul O’Reilly said. Tasman captain Cameron Lindsay was pleased to have earned a win that keeps Tasman right in the playoff picture in fifth. “We haven’t started the new year that well and have conceded a bunch of goals so we’re delighted to come back after going behind and put away four in the end,” he said. There was even more drama at the Trusts Arena in west Auckland, where the Wellington Phoenix Reserves turned a 2-1 half-time deficit into a 3-2 victory over Waitakere United. The hosts took the lead via a deflected Ryan Cain effort halfway through the first period but it was a short-lived advantage as Hamish Watson equalised a minute later. Keegan Linderboom then put Waitakere in front a few minutes before half-time but it soon began to go horribly wrong for Chris Milicich’s side. First, Julyan Collett lofted a misplaced back pass over Liam Anderson’s head for an own goal to level the scores and then, with ten minutes remaining, Stewart Mackay was shown a second yellow card for dissent. The ‘Wee Nix’ did not take long to make the most of their numerical advantage, Ollie Whyte finishing off an attack to secure a confidence-boosting win for the youngsters. Assistant coach Paul Temple was particularly satisfied with the Phoenix players’ approach to the less-celebrated parts of the game, an aspect the management staff have been drilling into them in recent weeks. Milicich felt fortune didn’t shine too kindly on his Waitakere men. The least dramatic encounter of the day took place in the capital, where Team Wellington stayed on track to successfully defend their title with a hard-earned 2-1 win over Hawke’s Bay United. Knowing a positive result was needed to stay in the playoff running, the well-organised Bay put in a determined showing and frustrated Wellington for most of an evenly-fought contest. It took until the 70th minute for the hosts to finally break the deadlock at Porirua Stadium, New Caledonia international Roy Kayara leaping athletically to head in a corner. Having laboured so long to take the lead, Wellington did not have to wait much longer to go further in front as freshly-signed English import Ross Allen justified the prolific reputation he arrived with by tucking a shot into the bottom corner soon after coming on. But Jose Figueira and his side were in for a nervy final few moments after another English debutant, midfielder Sam De St. Croix, made an immediate impact for Hawke’s Bay with a sharp volley after joining from Hamilton Wanderers. The visitors were given even more of a lifeline when Wellington’s Sekou Diane was dismissed in the 90th minute for a second bookable offence. But the hosts held on to ensure they would share the competition lead with Eastern Suburbs. Skipper Justin Gulley believed his team’s task was made more tricky by a bobbly surface and the stifling conditions. Midfielder Gavin Hoy said the Bay, who nearly claimed the lead on a couple of occasions in the first half, took a blueprint into the match but struggled to alter their approach after falling behind.